85% visiting Aqua Sana Longleat Forest come to celebrate a birthday, a reunion or have a catch up with friends or family. With so many with so much to celebrate whilst at Aqua Sana, a new exclusive private relaxation area called The Hideaway, has been introduced. This private area gives groups the opportunity to celebrate in their own cosy space with easy access to the spa which has a variety of experiences to try. The high number of spa visitor celebrations shows that a majority of visitors to this spa have a special reason to be booking a spa session with Aqua Sana. The spa welcomes more than 50,000 visitors each year, 25,000 of whom are Spa Day visitors from the local area. What these spa visitors have in common is a desire to escape into a relaxing environment within a lush forest setting, with people who are special to them and mark a special occasion or time in someone’s life. In the spa right next to The Hideaway, Aqua Sana visitors can explore each of the different spa experience rooms. There are uplifting aromas, soothing steam and calming music. Multi-sensory effects relax the body and clear the mind. With 16 different spa experiences, from wet, to dry, from herbal to meditative, visitors can create their own spa journey. Aqua Sana Spas have the widest choice of globally inspired spa experiences available in the UK. The Hideaway is a great place to spend time with friends and family to mark a special moment. This is a lounge-like area exclusive to Hideaway guests for six to 12 people with an area for relaxing, private dining, washroom facilities and a mini treatment area. Guests in The Hideaway have full use of the spa and a dedicated spa host will be on hand during the day. The Hideaway is perfect for a special occasion or even just to catch up with those special to you. There are four packages to choose from starting from £50 per person. For more information visit www.aquasana.co.uk or call 01985 848374. 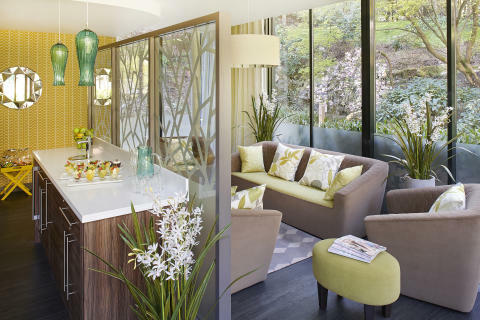 Located in Wiltshire, nested within approximately 400 acres of forest (at Center Parcs). Aqua Sana Longleat Forest opened in 1994 at the same time as Center Parcs Longleat Forest and offers more than 16 spa experiences and more than 60 treatments to choose from. Aqua Sana Longleat Forest attracts hundreds of people to the local area each year. 78% of Spa Day visitors travel 90 minutes with some visitors travelling as much as 150 minutes. Most popular treatments at Aqua Sana are massage treatments but particular favourites at Longleat Forest are the Tranquillity Scalp Massage and Pedicures. We’re delighted to announce that Center Parcs Longleat Forest was today awarded fifth best hotel in the UK for families in the TripAdvisor Travellers’ Choice Awards. July 14th 2014 is a very special date for Center Parcs Longleat Forest, it marks twenty years since the Village opened to guests for the first time. As the third of the Center Parcs Villages to be built in the UK, Longleat Forest became an instant hit with guests and has become one of the most popular short break destinations in the UK.